Each contain other qualities highlighted below to help you choose which one will suit you. Colour. A soft beige tint from the botanical ingredients has proven to be very popular for those who like to offset any possible whiteness from the zinc oxide. This sunscreen is a great favourite and many people choose this as their everyday sunscreen for both body and face, for young or old, and for all skin types. Potential Staining. The tint can cause some staining but is avoidable with application care and is easily removed. eg. Apply and let dry before you put clothes on and preferably don't wear white clothes. Remove any sign of stains using a non-toxic bleach before washing. 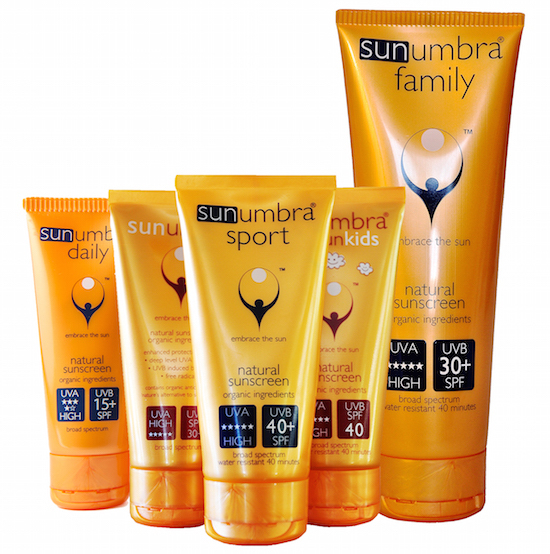 If you prefer not to have to manage any potential for staining, see our Non-tinted sunscreens - Sunumbra Sport, Sunumbra Daily and Sunumbra Family below. Staining is possible The tint can cause some staining but is avoidable with application care and is easily removed. eg. Apply and let dry before you put clothes on and preferably don't wear white clothes. Remove any sign of stains using a non-toxic bleach before washing. The main purpose is to provide a light, non-whitening, moisturising, DAILY sunscreen that still provides excellent balanced protection from both the UVA and UVB rays. Many people choose to wear this every day as their moisturiser, or on top of their moisturiser. Those with a dry or combination skin type sometimes prefer to wear it on top of their moisturizer. An oily skin type typically wears only the Sunumbra Daily sunscreen. Mixing your moisturiser together with this sunscreen will detract from the SPF and UVA protection effect, so rather wear it on top of your moisturiser. Sunumbra® daily also contains properties that boost your skin’s natural health abilities, from the inside out, no matter whether you’re exposed to the sun's rays or not. Wearing it daily will therefore increase your own body's internal protection capabilities. "2017 Best Moisturizer with SPF" report"